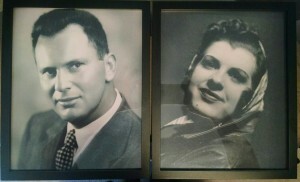 My paternal grandfather smoked himself to death when I was 3 years old. I only have one memory: His face as he was picking me up. My beautiful, amazing Grandma was lonely for 38 years until she passed on. She also suffered from emphysema, although she never smoked herself. Because of them I am determined to help you quit smoking, and it really is free. There’s no purchase required or other hidden charges. I pay my rent by treating other conditions, but this I do simply because I am passionate about it. All I ask in exchange is that you respect my time and efforts, and keep your appointments. Last minute cancellations and no-shows will be charged a missed appointment fee, just like my regular patients. Here’s the scoop: Using acupuncture on the ears and wrists speeds up the detox aspect of quitting. The nicotine flushes out of your system more rapidly, leaving you with less irritability, fewer jitters, and reduced cravings. It won’t make you want to quit, but it will make quitting easier. 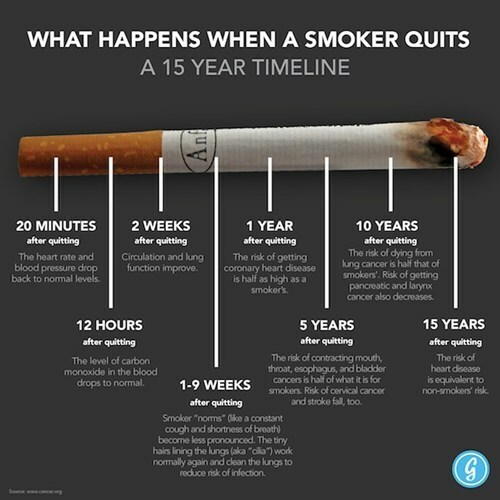 I’m going to show you a few things about the effect of smoking on your body you may not know about, explain the process, then we’ll get to the good stuff: 10 tips to help you toss out the cancer sticks for good! Nearly every single disease you can ever contract will be worse if you are a smoker (because your body can’t get enough oxygen to fight back), and your odds for getting these illnesses is vastly increased if you smoke. Seriously. It’s time to quit! 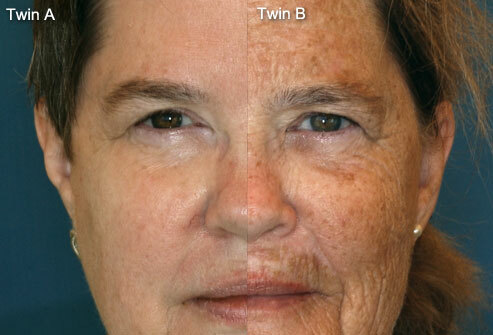 Twin B is a smoker and sunbather. Lung cancer gets all the press, but nicotine destroys all the capillaries in your body. Capillaries are how blood actually gets to and from your individual cells. As a result, all of those cells are suffocated by a lack of oxygen. Decreased blood flow also means they can’t “take out the trash” so waste products collect. That’s right, smokers, your cells are sitting in their own poop. Wounds are slow to heal. Infections are harder to beat. Your skin turns to leather. 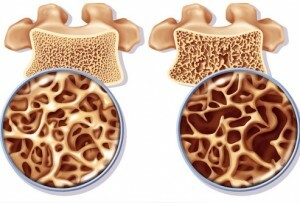 Your bones are weakened and make you more prone to osteoporosis. The same process that strangles cardiac blood vessels and causes heart attacks will cut off blood flow to your extremities, and many men suffer impotence. Smoker on the right. Note the difference in bone density, and the enlarged heart! In cases of very heavy smokers, Buerger’s disease can make your fingers fall off. I’m going to be nice and not include a pic here, but Google it if you’ve got a strong stomach. We’ve known for a long time “that thousands and tens of thousands die of diseases of the lungs generally brought on by tobacco smoking. . . . How is it possible to be otherwise? Tobacco is a poison. A man will die of an infusion of tobacco as of a shot through the head.” —Samuel Green, New England Almanack and Farmer’s Friend (1836). And that was before cigarette companies started adding caffeine, carbon monoxide, nitrogen oxides, hydrogen cyanide and ammonia. Forty-three known carcinogens are in mainstream smoke, sidestream smoke, or both. And if you’re pregnant? Wow. The 5NP (5 needle protocol) ear acupuncture is used to speed up the physiological aspect of detox from all chemical addictions. In addition, there are specific wrist points to help you quit smoking. Your cravings, irritability, and jitters will be much reduced by the acupuncture. I was trained in this system by David Eisen, one of the founders of NADA (National Acupuncture Detoxification Association), and honed my skills by volunteering at PAHC (Portland Alternative Health Center) working with post-acute withdrawal patients. Acupuncture won’t make you want to quit smoking, it just makes the quitting easier. You should taper down and be ready to quit at your first appointment, even if your last cigarette was only a few hours (or minutes) earlier. The needles I use are sterile, single-use disposable ones. They are only about the thickness of a human hair and relatively painless. The needles stay in for about 20 minutes. The acupuncture session by itself is very powerful, but I can also give you ear seeds on those points to take home. These are radish seeds on tiny squares of band-aid type tape, for acupressure on the detox points. If you’re needlephobic, we can skip the acupuncture and just do the ear seeds. 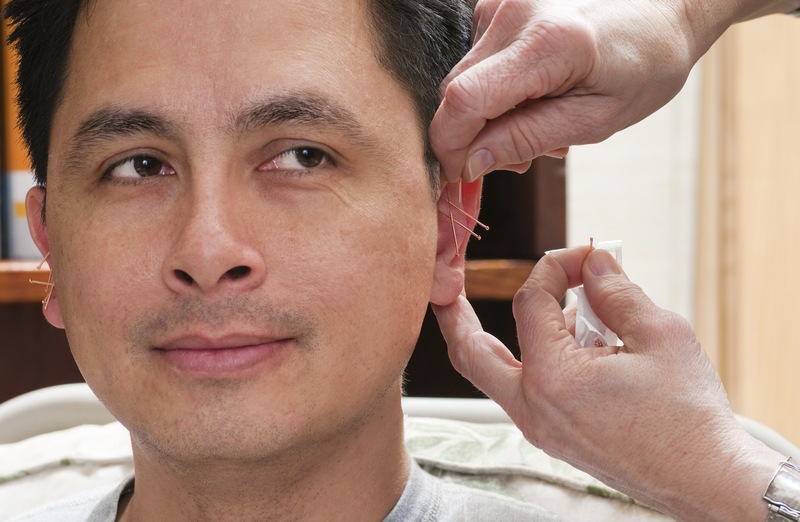 Ear acupuncture is relaxing and powerful! Ideally, I’d like to treat you three times over about a week. At that point the tobacco is pretty much out of your system, so the physiological part of the addiction is over. You will still have challenges with the psychological addiction, and it can take up to a year for your brain chemistry to return to normal. In the meantime you might feel foggy-headed as your neurons repair. It won’t be easy, but it will be doable! If you need “booster” treatments I’ll be happy to provide those, too. Quitting smoking really has two parts. One is the habits and psychological addiction. Reading this article should help with that. It won’t be easy – I can’t make you not WANT to smoke – but following this guide will make it easier to put up a fight. The other is the physical addiction to the nicotine. Some people prefer to use gum (or patches) to split this into two separate battles. 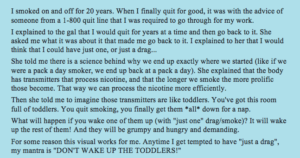 If you want to get over the habit part using a different delivery method for nicotine, then use me to ditch the nicotine afterwards, that’s a perfectly valid plan. It still counts as an effort to quit smoking and it’s still free. Since the point of the acupuncture is to get toxins (including prescription drugs) out of your system, however, seeing me is NOT COMPATIBLE with using Chantix, patches, e-cigs with a nicotine cartridge, or nicotine gum. Here are 10 tricks you can use to make quitting easier. 1) Find a substitution. This can be as simple as a 3 inch section of a plastic drinking straw for your fingers to play with. The people who do best tend to be those who pick up a new hobby, or reinvest in an old one. It doesn’t matter what you do. Build a model train set, or sing, or scrapbook. Play a game on your phone (My favorites right now are Zen Koi and 1010). I’ll be thrilled to teach you how to knit. I’d love for someone to take up the harmonica – it’s portable, and uses your mouth and hands. But simply going for a stroll around the block would probably be easier on the ears. 2) Identify your triggers. When do you tend to smoke? Figure out a way to break the rhythm of those habits. In the car? Completely Febreeze & detail your interior to reduce the smell. Instead of lighting up, rock out with the radio. Put your windows down – or up – whatever’s different. On break at work? Go for a quick walk around the building. When you’re drinking? Try going out to non-drinking events instead (movies, dinner at a smoke-free restaurant, etc) or at least hang out with non-smoking friends. You get the idea… come up with a way to change your patterns. 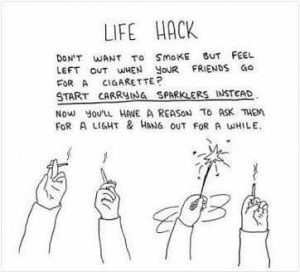 The trick is to be ready with an alternative, so you don’t default back to smoking because you can’t think of something else to do. Going for a walk around the block is always a great substitute and will help avoid weight gain. 3) If you used to smoke when stressed, focus on new ways to relax. Visualizations can be very helpful. Try some Deep Breathing techniques. Every time you want a cigarette, do this instead: Close your eyes. Inhale the deepest lung-full of air you can. Really fill up your chest. Exhale very slowly. Visualize all the tension leaving your body, slowly draining down your body and out of your fingers and toes. Repeat that three times (at least). With some practice, you’ll be able to use it to deal with terrible bosses, screaming children, or those ever-vigilant tow-trucks. 4) Consider finding a sponsor (think AA). This can be someone who quit in the past, or someone who’s just determined to help you. Call them when your cravings get bad, 24/7, and they’ll help divert you by reminding you of all the reasons you decided to quit. 5) If getting mad will help you stay strong, think about those rotten tobacco companies and how they’ve been knowingly profiting from people getting sick for years. Refuse to give them any more of your money! 6) Remember that both tobacco plants and cigarettes have been engineered for decades to maximize your addiction. It’s actually harder to quit smoking than heroin! Understand that it’s okay if you aren’t perfect. Most people need a few tries to quit for good. Just keep on trying! Identify why you slipped and build a better strategy (or reinforce your old one so it’s stronger). Learn from your mistakes… and pretty soon you’ll be smoke-free and happy! 7) Eat your veggies! Previous data has shown that smokers tend to consume fewer fruits and vegetables than non smokers. It turns out that certain foods actually make the taste of cigarettes worse – especially milk, dairy products, and fruits and vegetables– while, coffee, red meat and alcohol make cigarettes taste better. Studies further suggest that cravings for food and cigarettes are likely linked and often confused with one another. So one thought is that eating a diet with higher fiber content may actually make you feel fuller and prevent such “craving confusion” from developing. In practical terms, however, individuals who consume more fruits and vegetables are probably more health conscious and thus more likely to quit smoking overall. 8) Drink a lot of water. Your body will be going through a heavy detoxification. Help it out by diluting your system with a few extra glasses of H2O. Caffeine and sodas are diuretics (they make you pee) so you’ll need some extra water if you have those as well. 10) Remember that you only get this one body. You can’t trade it in, and you can’t buy a new one. You HAVE to take care of the one you’re wearing, because hopefully you’ll be around for a while, and Future You is going to want to look and feel as good as possible.